Substances can cross the cell or organelle membrane by either a passive or active transport mechanism. - Generally limited to small, non-polar substances - Molecule dissolves in phospholipid bilayer, diffuses across it, then dissolves in the aqueous solution on the other side. E.g. Lipids; steroids; lipid-soluble molecules; Uncharged molecules, such as O2, N2;; Alcohol; Anaesthetic gases (ether); Pesticides; and non-polar solutes, such as CO2, urea. - Water (polarized) can also diffuse slowly through the lipid by-layer - Water is a special case, passing through the membrane by osmosis. 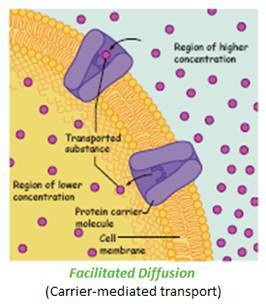 Substances are transported down an electrical or chemical concentration gradient facilitated by a carrier-protein or ion-channel spanning the membrane. Solutes, such as charged ions in solution (E.g. Na+, K+ and Cl- as solutes) require a carrier or channel to cross the membrane to avoid coming into contact with the water-hating core of the membrane lipid-bilayer. (A carrier or channel is made of protein molecules with a water hating, lipid loving exterior which “happily” spans the membrane, and a water-loving center through which water and small water soluble molecules can pass). Some substances, such as glucose, are too large to pass directly through the membrane, but are able to cross when provided a carrier large enough to accommodate them. Some molecules, such as starch and proteins, are just simply too large to cross the cell membrane. - A carrier-protein - binds a selective substance on one side of the membrane, and then following a change of shape, the protein releases the substance on the other side of the membrane. Each carrier protein is designed to respond to only one substance. Used to transport small organic molecules (E.g. glucose, sucrose, amino acids) and some inorganic ions(E.g. K+, Na+). 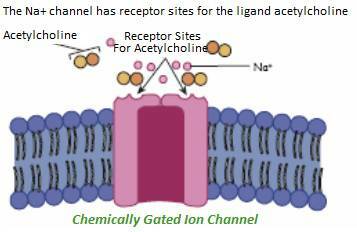 - An ion-channel - is a tiny pore generally used to transport only inorganic ions (E.g. K+, Na+ Cl– , Ca2+), but 1000x faster than by carrier protein (Ions move single file at 108 /second). Most ion-channels are selective of the type of ion they allow to pass. 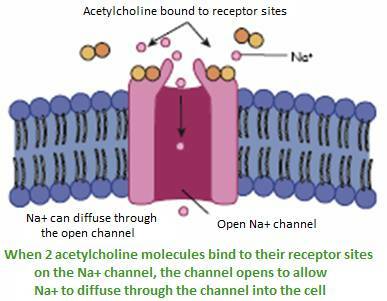 ✔ “Switch-Operated” GATES for Ion-channels - most ion-channels contain a “switch-operated” GATE that may be opened or closed, such that a channel only transports when the gate is opened in response to an external chemical, electrical or mechanical stimulus or by conditions within the cell. (1) Chemically-gated (also called ligand-gated) – Opened/closed by certain binding molecules (e.g.neurotransmitters, hormones). (2) Voltage-gated – opened/closed by a change in the cell membrane voltage - K+ and Na+ ion-channels are voltage-gated. The voltage is mainly determined by the balance of K+ and Na+ ions either side of the membrane. The transferral of ions further changes the cell membrane voltage. (3) Electromagnetic Gate – Opened/closed by specific-frequency electromagnetic signals produced by the body or received from the external environment. (4) Mechanical-Gate – E.g. Opened / closed by sound waves bending the hair cells of the inner ear leading to the creation of nerve impulses, which the brain translates into sound. When there is an electrical or chemical gradient (called an electrochemical gradient) opposing the movement of an ion or molecule across the membrane, a special transport protein pump is needed to convey the ion or molecule. 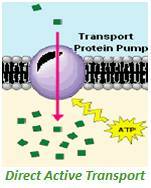 - Active transport enables the cell to remove waste products from the inside of the cell - into the extracellular fluid. 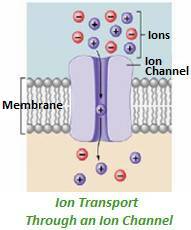 - Active transport also supports the vital imbalance of ions - such as K+, Na+, Ca++ and H+ across the membrane. The Na/K pump pumps sodium ions (Na+) out of the cell and potassium ions (K+) into the cell, across the membrane against the electrochemical forces, in order to maintain the "cell battery” voltage. Involves using energy to establish a gradient across the cell membrane, and then utilizing that gradient to transport a molecule against its concentration gradient. 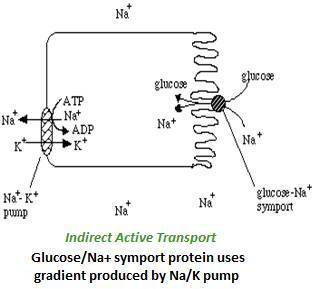 The Na+/glucose indirect active transport mechanism, in particular, uses the Na/K pump as the first step, generating a strong Na+ gradient across the cell membrane. Then the glucose/Na+ symport protein uses that Na+ gradient to transport glucose into the cell. (Symport means binding two molecules at a time and using the gradient of one solute's concentration to force the other molecule against its gradient).